← I was there & even I don’t believe it!! Our trip to Shanghai started out with a massive fizzle, we were delayed over 8 hours. Stuck at LAX so close to home but not able to leave the airport, you know, just in case. There was no just in case, our flight was delayed for the entire estimated time and then some. We had 8 hours to kill and the United terminal at LAX is kind of lousy. We toyed with the idea of paying for the lounge but ended up just having dinner at Wolfgang Pucks and entertaining ourselves with iPad Air Hockey and Scrabble. Finally on the plane, yay!! for a 13 hour flight. This would all have been very frustrating except that it was only a small matter of time and distance that was standing between me and a gala that included Patrick de Bana, Manuel Legris, and Isabelle Guérin. Go ahead, United Airlines, try to kill my buzz! Not possible, a sleeping pill and 13 hours later, we’ve lost a day to air travel and another to the time difference but we are setting down in China and there is dance in my very near future. It is after midnight by the time we get through the airport, retrieve our luggage off the revolving belt, and find our hired car to the hotel and it is sticky and sweltering. I’m not good with humidity. I believe that sweating should be post-something really good that doesn’t include just walking, standing, or breathing… and wet heat makes it hard for asthmatic’s like myself to breathe. I brought three inhalers, a spacer, and an EpiPen, just in case. It’s another 45 minutes or so to the hotel, at least the van is air-conditioned but that only serves to create a salty crust, I feel like a smelly pretzel. We pull up to the entrance of our hotel and I somehow unfold myself out of the vehicle onto the hot pavement and reach for my suitcases. As I turn around ready to complain to Carboy about the heat, suddenly there are no sounds to the words that I think are still coming out of my mouth – Patrick de Bana, Manuel Legris, and Friedeman Vogel have gotten out of a cab in front of us and are going into the hotel. Shanghai stroke #1. By the time we get into the hotel lobby to check in, they have disappeared into the elevators. Complaints, gone; happiness, returned. Our hotel is across the street from the People’s Park, very green, very pretty. The Shanghai Grand Theater and the Shanghai Museum are both located in the park. So, of course, first things first, we make sure that we know how to get to the theater and then we go wandering – the city is amazing, fully of energy and literally a buzz with these super noisy bugs in the trees – they kind of freak me out a bit. Humidity usually results in really LARGE insects. I remind Carboy that in the event of an insect uprising, I will be running so he should stay close and do likewise. I think it’s always good to have an escape plan.We are at the Propaganda Poster Art Museum when I get a text from Patrick. Please come to the stage door at 6:30pm, the Friday night performance was bought out by Buick (?!?) but he would make sure that we got a seat somewhere. Actually, it had taken me a while to figure out how to text him, I don’t normally text internationally but once I figured out the prefixes, it was all good. We were in the French Concession part of Shanghai, leave it to me to find the Paris part of any country, and we weren’t really sure where we were exactly because the maps on the iPad seemed to be a little off so we kept going around in circles. We weren’t too concerned about it until it started to rain and by rain, I mean deluge of Biblical proportions. I was expecting an ark around every corner. Completely lost, completely soaked, not a taxi to be found, I was not for a minute considering missing the performance. I ran us into a hotel and did a pathetic, lost, tourist routine to the concierge who hailed a taxi for us and forty minutes later we are back at our hotel with enough time for a shower so that we didn’t have to show up at the theater looking like drowned rats. The rain let up and it was actually a really pretty stroll to the stage door. The next day was major stroke after major stroke, everyone was lovely and welcoming, even though I was usually speechless and spastic. We watched class and I was amazed that it was so similar to my own. 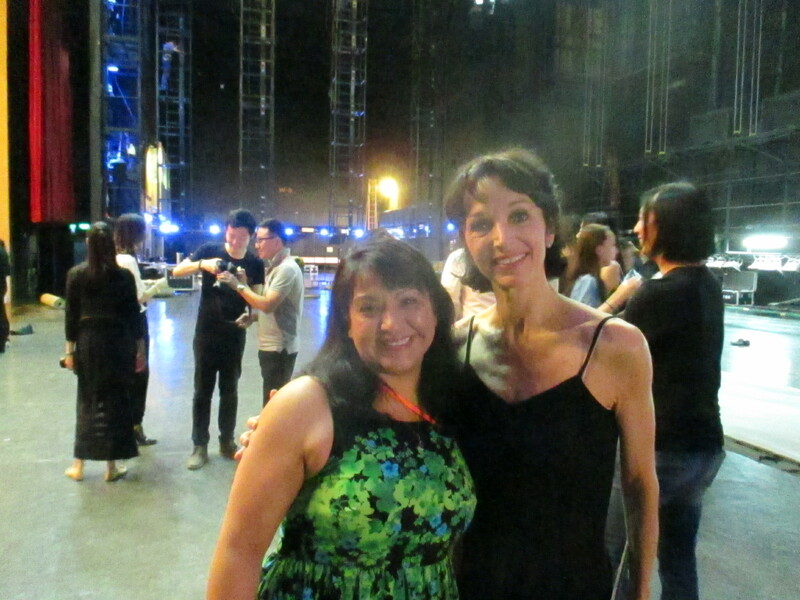 The beautiful Director of the Shanghai Ballet, Lili Xin, taught class – she has the most mesmerizing arms and hands and taught a great class. The center work ended with turns and Lili gave her own young dancer, Wu Husheng, a few corrections. His turn looked perfect to me so I asked her about the corrections, which lead to a mini lesson in the importance of turning up rather than focusing on going around. 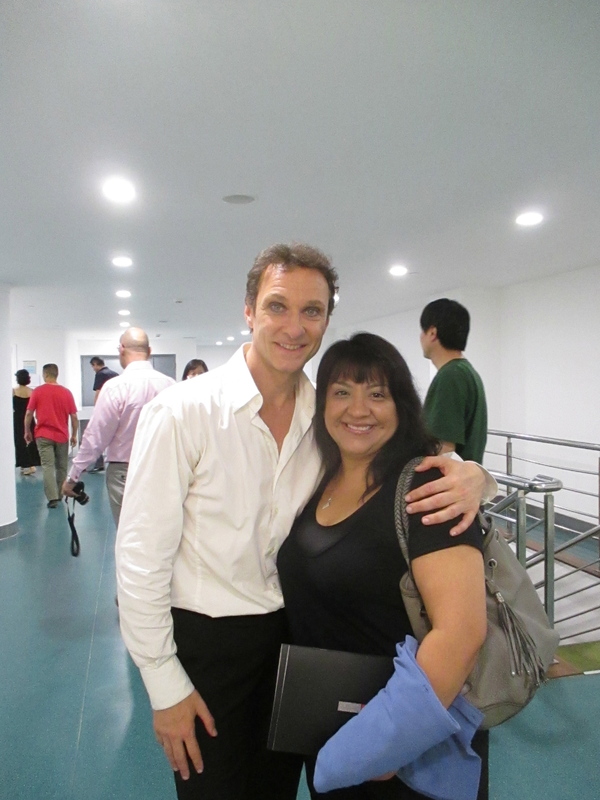 Later that evening before the performance, I got to watch Isabelle mark The Farewell Waltz, the new choreography that she will dance with Manuel. That was incredible. She was in her own world just marking the choreo in a hallway but she was so focused, so internal; I kept perfectly still and tried not to be intrusive, there was something magical about being able to witness it – that was certainly something very very special, sacred. After the performance, we went backstage again – I’ve been backstage at events in college and even small clubs, come on, everyone in L.A. has been in a band at one point in time or another but this was different. I almost didn’t go. You’ll recall that I was on the backstage list at the last Kings of the Dance performance here in Southern California and I basically chickened out, I stood in the wings for a bit and then ran out of there before I could make an idiot of myself. The only thing that kept me there was the need to say thank you to Patrick for the amazing day – one does not get a bunhead fantasy day and then fail to offer up lots and lots of thanks, plus, Carboy was pretty insistent. It’s hard to run when a Carboy is attached to your arm. He’s kind of heavy. I’m really not sure how it happened – at this point I think you could actually hear sizzling sounds coming from the constant strokes in my brain – but the next thing I know, we are still hanging out and on our way to dinner where we spend an amazing evening with some of the nicest, funniest people I will ever have the great pleasure of meeting. Carboy spends much of the evening talking to Matt Golding about vacations and cars, Matt is quite chatty. Back at the hotel, it’s been an unbelievable day and I’m sure based on my level of excitement and the number of strokes, I’m positive that I’ll never sleep again. It was beyond amazing and I haven’t even told you about the performance yet!! This sounds wonderful. Lovely photos. I’m telling you, Stef, I cannot believe it myself!!! Seriously, Robin, I cannot be sure there was not permanent brain damage, so many full-on major strokes. And you know I do not have a poker face so I’m positive that I gave these poor people many a “are you talking to me? !” and “WHY are you talking to me? !” crazy looks. Especially Manuel, he was so nice but my entire frontal lobe would short out every time he tried to have conversation. CarBoy said that I was coherent a couple of times and he swore to me that Manuel seemed to think it was cute. But I have my doubts. omg, wish i could have seen you. i have no doubt you were adorable & that manu thought so as well 🙂 glad to hear you were at least semi-coherent at least!! and sheesh matt golding too – swoon. Thanks, hon! It was amazing! !